Click on song title to hear clips. 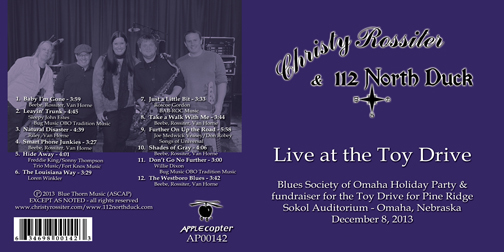 To buy "Live at the Toy Drive"
The Duck “Duck Banner” by Kenneth W. Justman; House engineer-Marty Bierman; Monitor engineer-Doug Huggins. Special thanks to: Al Doub, for driving the bus; Marty Bierman; Doug Huggins; Justin Rudiger; Larry Dunn; Al & Michelle Irions; Clete Baker; Joe Voda; Dan & Gary at Sokol; Bogie; Steve Malott; Almeda Berkey; Zachary, Kim & David Beasley; Nils Anders Erickson; Marilyn Thomsen; Grant Bowerman; Gary & Tom & the good folks at Wick’s Truck Trailers; Jeff & Jason at Powers Automotive; Dan Cerveny at Omaha Musician’s Assn., Local 70-558; Beth McBride; Steve Kocer; Paul Godtland; Marti & George Wilson; Terry Tonkinson; Fr. David Hemann; Darren Hopson; Linda & Franz; My Angel Donny; Gerry, Tammy, Ariel and Henry Talacko; Amy Van Horne; Dr. Michelle Aizenberg, Dr. James Gigantelli and all the staff at UNMC; and most importantly, the people who are kind enough to purchase our products and attend our shows.